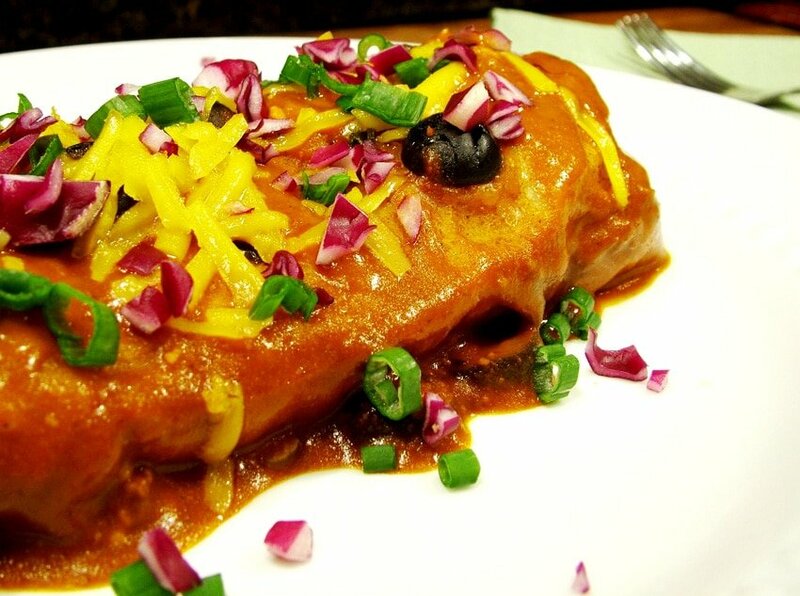 If you like easy homemade meals and Mexican food, then you should like these burrito enchiladas. Or, maybe a better name is an enchilada burrito. In restaurants you may have seen them referred to as “wet burritos”. Either way, they are pretty darn good and are quite filling if you eat a whole one. 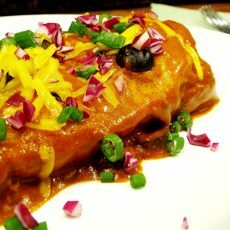 Bottled or canned enchilada sauce is so handy to have on hand for dishes like these delicious burrito enchiladas. 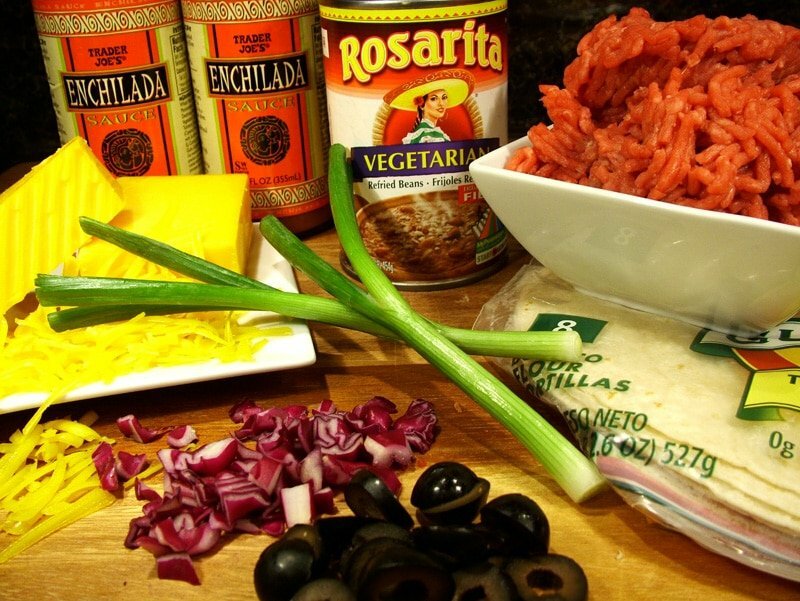 Here’s another recipe using prepared enchilada sauce “One-Skillet Enchilada Sauce Taco Meat“. 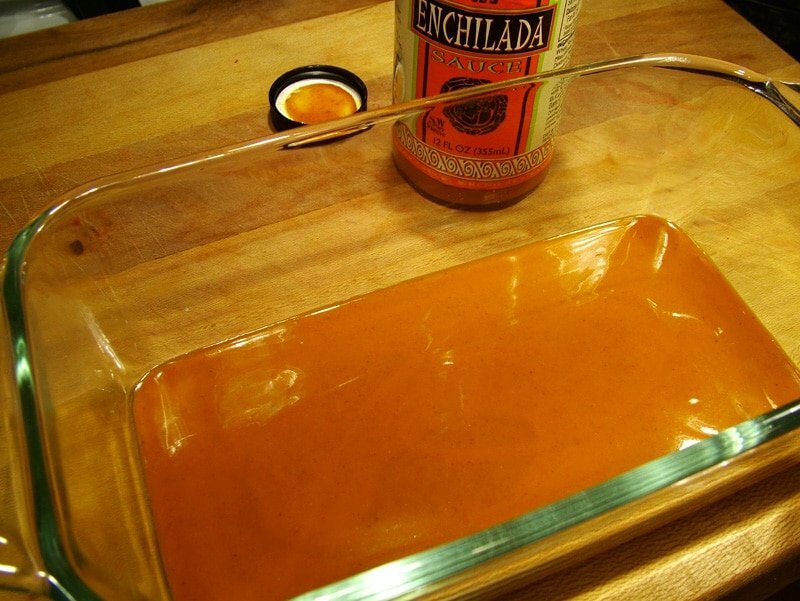 Homemade enchilada sauce is easier than you may think to make. Here’s a recipe for “Homemade Ancho Chili Enchilada Sauce” with step-by-step pictures and instructions. These enchilada burritos can be made ahead of time and they just need to be warmed up in the oven before serving. And feel free to customize the filling ingredients to your liking. 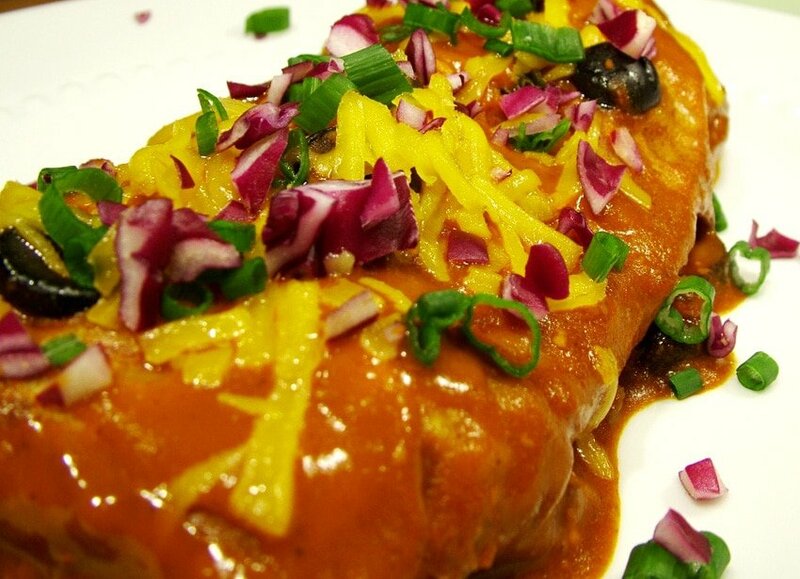 Top these enchilada burritos with sour cream, “Easy Homemade Guacamole“, “Pico de Gallo“, “Roasted Garlic Tomato Salsa“, “Cilantro Garlic Salsa” or “Roasted Tomatillo and Green Chili Salsa“. Serve with a salad, “Chipotle Lime Tortilla Chips“, or just by themselves. 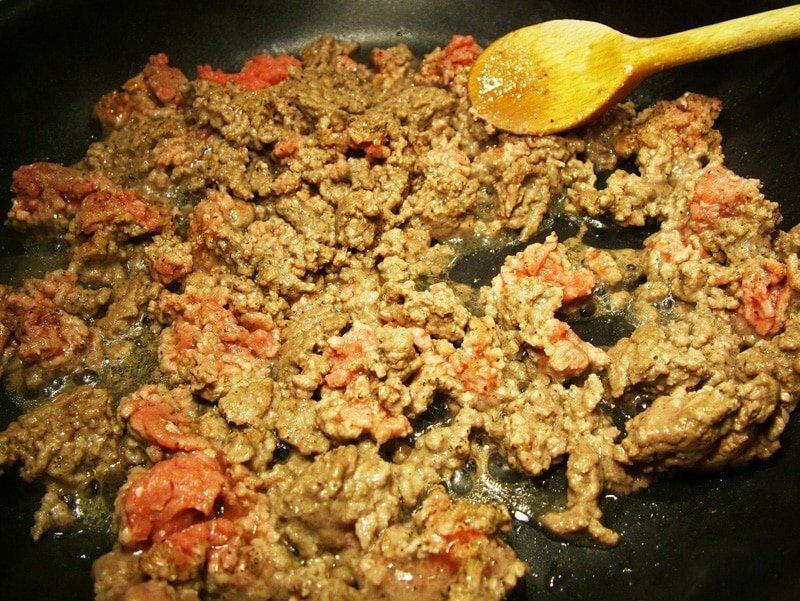 For the Ground Beef – Heat a medium size skillet on medium heat and add ground beef, pepper, salt and granulated garlic. Stir the spices in with the ground beef. Use a heat resistant spatula or wooden spoon to break apart the ground beef so that the pieces are all about the same size. Continue to stir as the ground beef cooks. When the ground beef is thoroughly cooked, transfer it to a paper towel-lined plate to drain off any excess grease. Cover with a paper towel and set aside for a moment. For the Filling – For easy access, place the refried beans, sliced black olives, chopped green onions, and shredded cheese in small bowls or on a large plate. 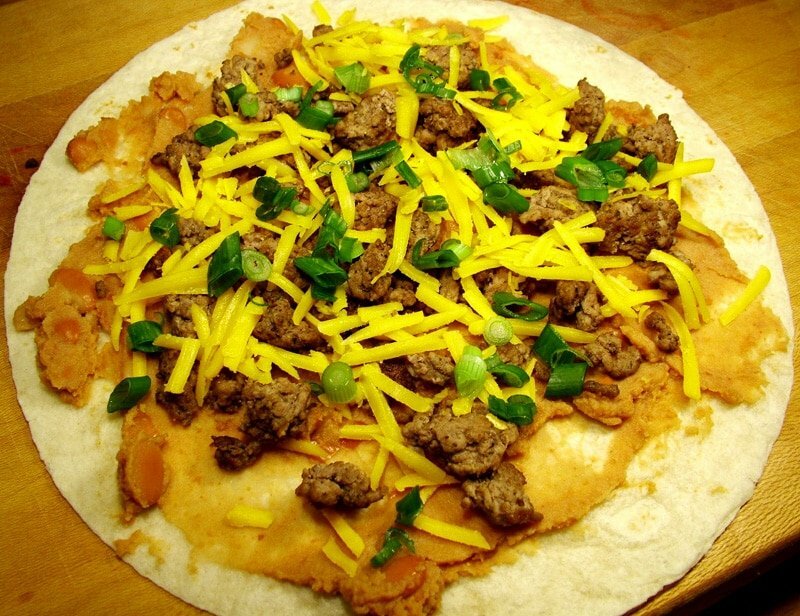 Filling the Burritos – On a flour tortilla, using a spatula, spread a thin layer of refried beans (don’t go all the way to the edges of the tortilla). Leave about an inch from the edge free from beans (or other ingredients). On top of the beans, spread a thin layer of cooked ground beef. Then a layer of shredded cheese. 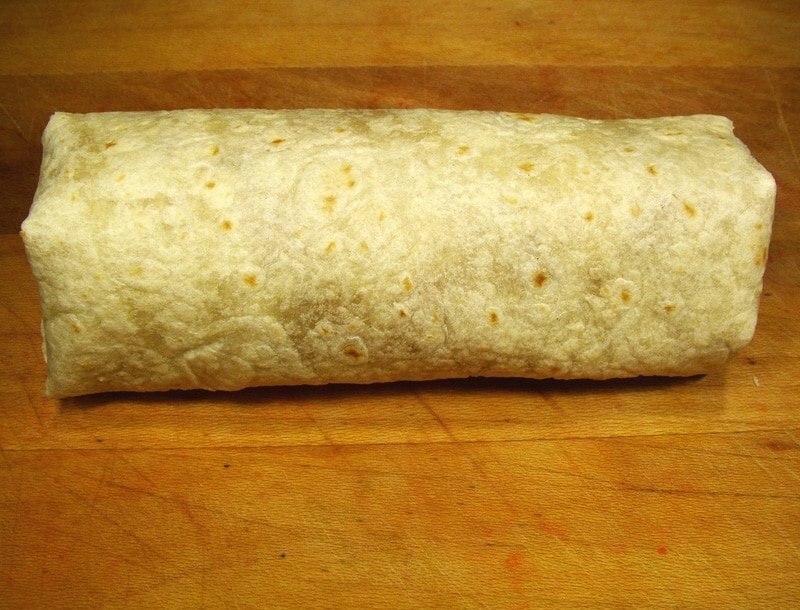 …then start to roll the burrito on one of the “unfolded” sides and continue rolling as tightly as possible all the way to the opposite side. Repeat the filling and rolling process for the rest of the burritos. 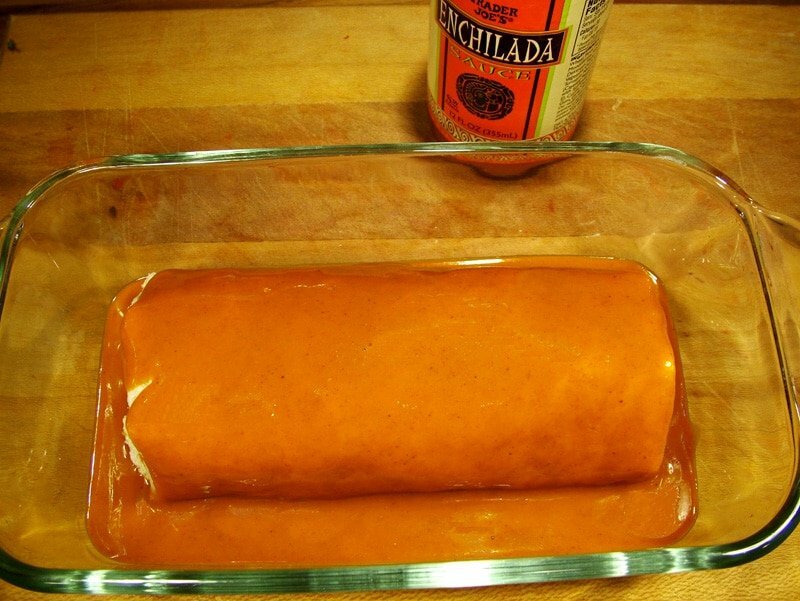 Baking the Enchilada Burritos – In a large rectangular casserole dish, pour a layer (about 1/4 to 1/2 of an inch deep) of enchilada sauce. Set the burritos in the casserole dish leaving space in between each one. 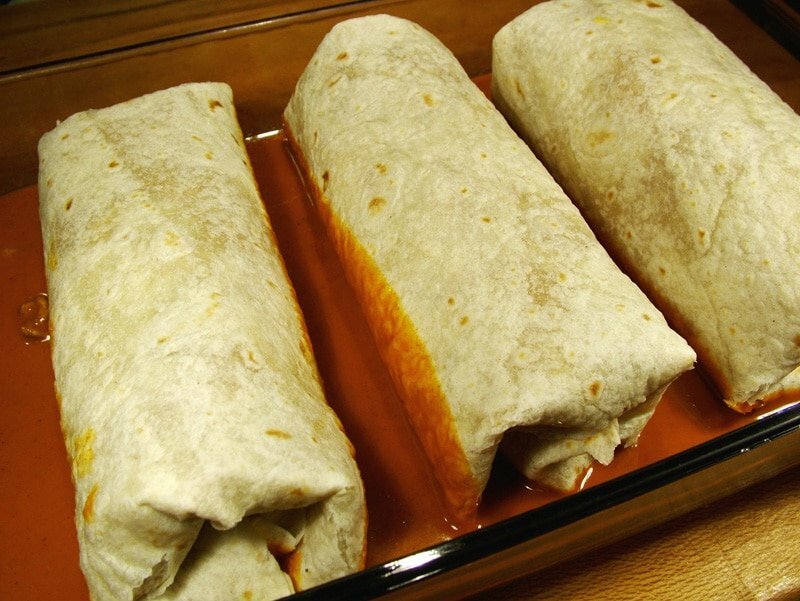 Pour the rest of the enchilada sauce over the burritos. 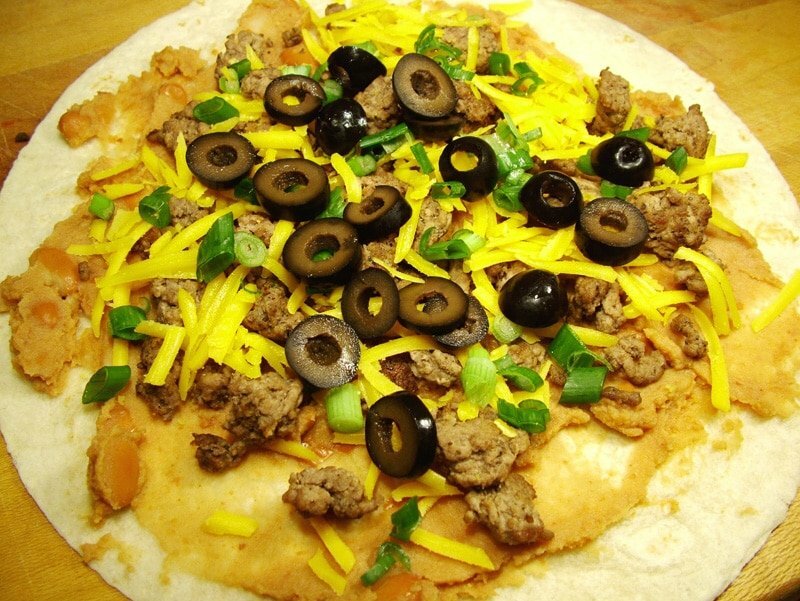 Top with shredded cheese, sliced black olives and chopped green onions. 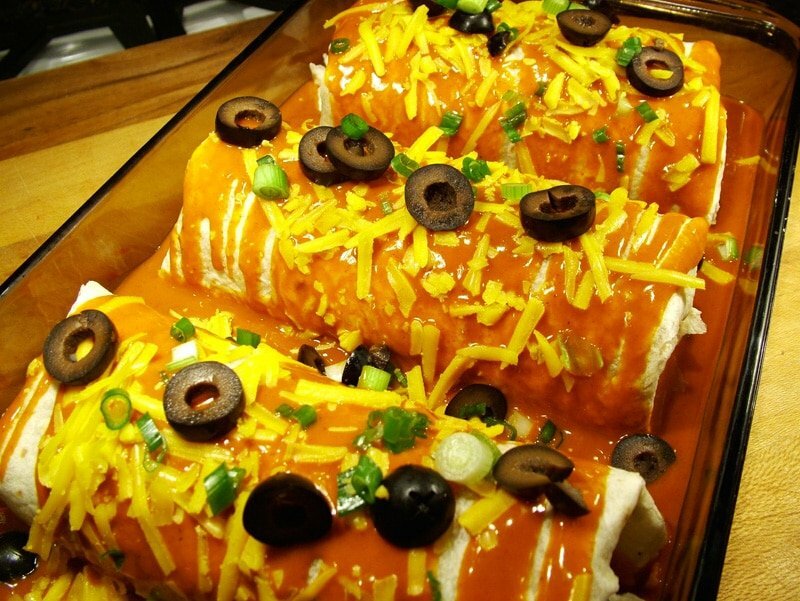 If using a casserole, or baking dish large enough for multiple burritos, make sure they’re not touching one another. Cover with foil and bake in a preheated oven until the burritos are hot all the way through (about 30 minutes). Use a long piece of foil so that it can be lifted high enough over the enchilada burritos so that it doesn’t touch the cheese on top. For Garnish – Serve warm and garnish with more shredded cheese, sliced black olives, chopped green onions and chopped red cabbage. 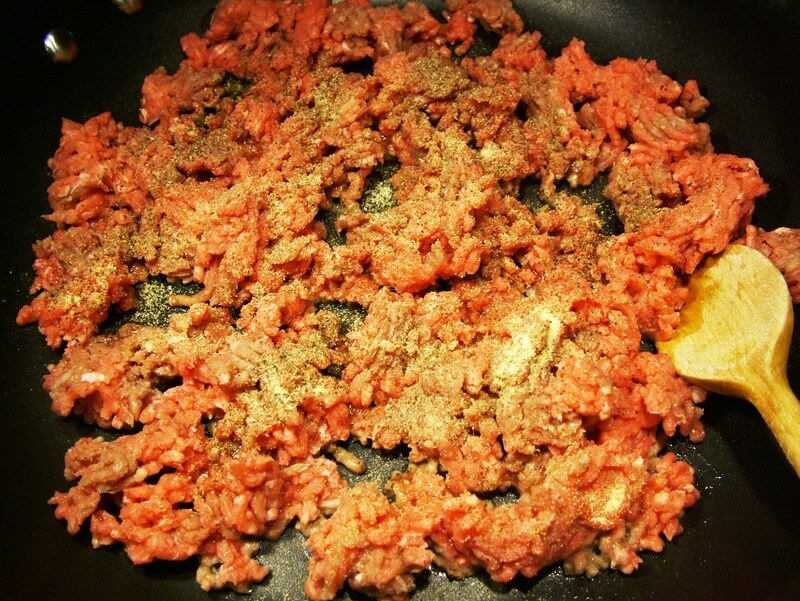 For the Ground Beef - Heat a medium size skillet on medium heat and add ground beef, pepper, salt and granulated garlic. Stir the spices in with the ground beef. Use a heat resistant spatula to break apart the ground beef so that the pieces are all about the same size. Continue to stir as the ground beef cooks. 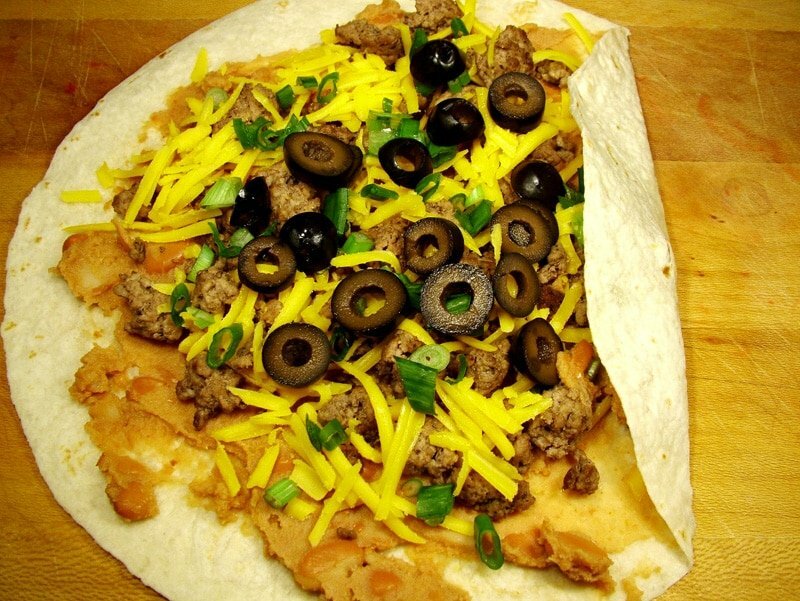 For the Filling - For easy access, place the refried beans, sliced black olives, chopped green onions, and shredded cheese in small bowls or on a large plate. 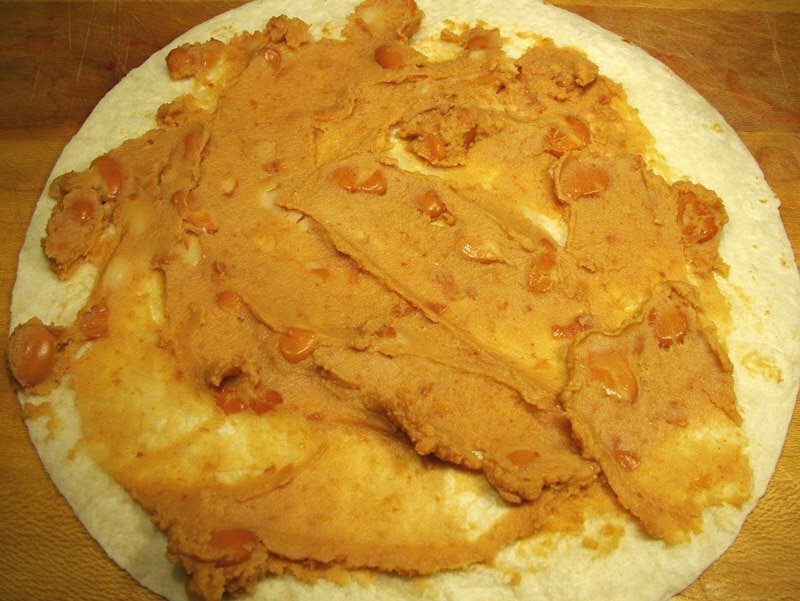 Filling the Burritos - On a flour tortilla, using a spatula, spread a thin layer of refried beans (don't go all the way to the edges of the tortilla). Leave about an inch from the edge free from beans (or other ingredients). On top of the beans, spread a thin layer of cooked ground beef. Then a layer of cheese. Next add sliced black olives, and chopped green onions. Rolling the Burrito - Roll the burritos by folding over one side, then fold the opposite side. Then start to roll the burrito on one of the "unfolded" sides and continue rolling as tightly as possible all the way to the opposite side. Baking the Enchilada Burritos - In a large rectangular casserole dish, pour a layer (about 1/4 to 1/2 of an inch deep) of enchilada sauce. Set the burritos in the casserole dish leaving space in between each one (don't let the burritos touch one another). 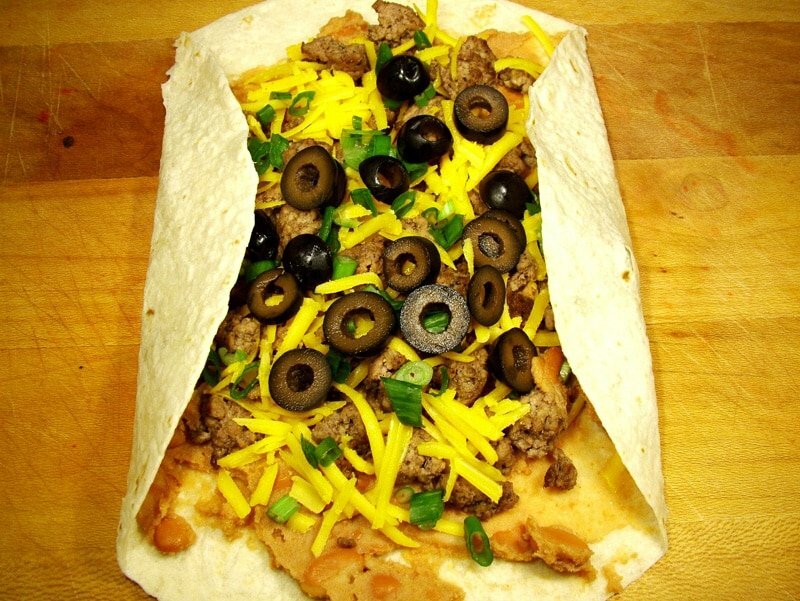 Cover with foil and bake in a preheated oven until the burritos are hot all the way through (about 30 minutes). 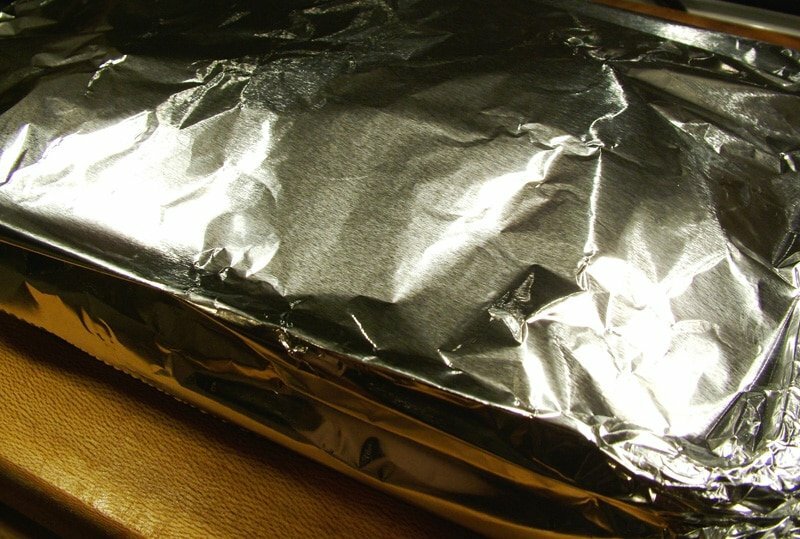 Use a long piece of foil so that it can be lifted high enough over the enchilada burritos so that it doesn't touch the cheese on top. 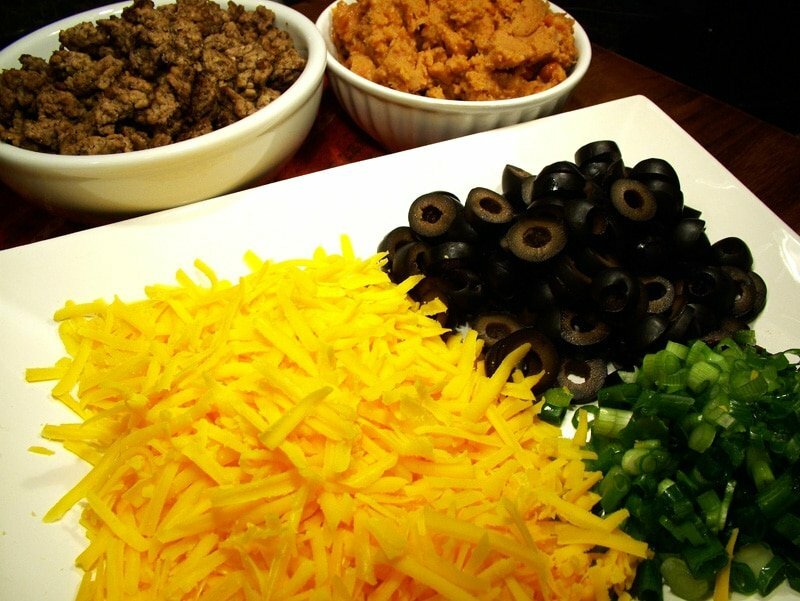 Serve warm and garnish with more shredded cheese, sliced black olives, chopped green onions and chopped red cabbage. Just made this recipe came out good..
Hi Anna, thank you so much for letting me know. I’m glad you liked it! 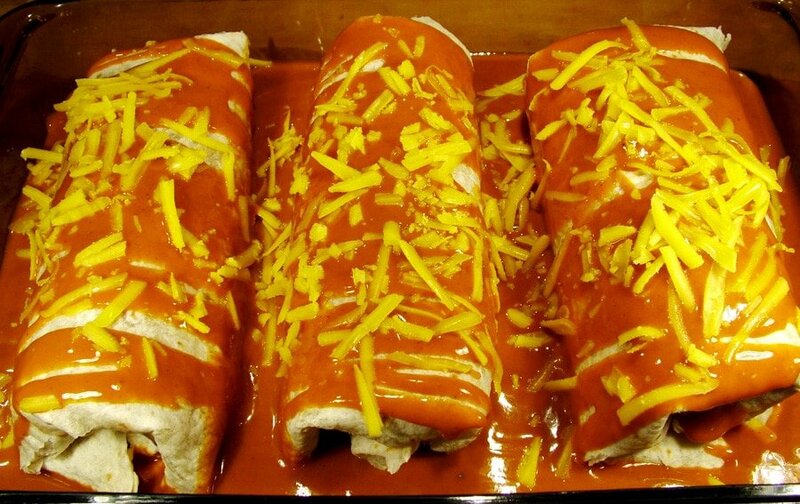 Wow, your burrito enchiladas look gorgeous and sound just delicious! So delicious, in fact, that I’m going to use your recipe tonight to make some for supper… thank you so much for posting this terrific recipe. Can i use ground chicken instead of ground beef? Will the taste or cooking method vary? 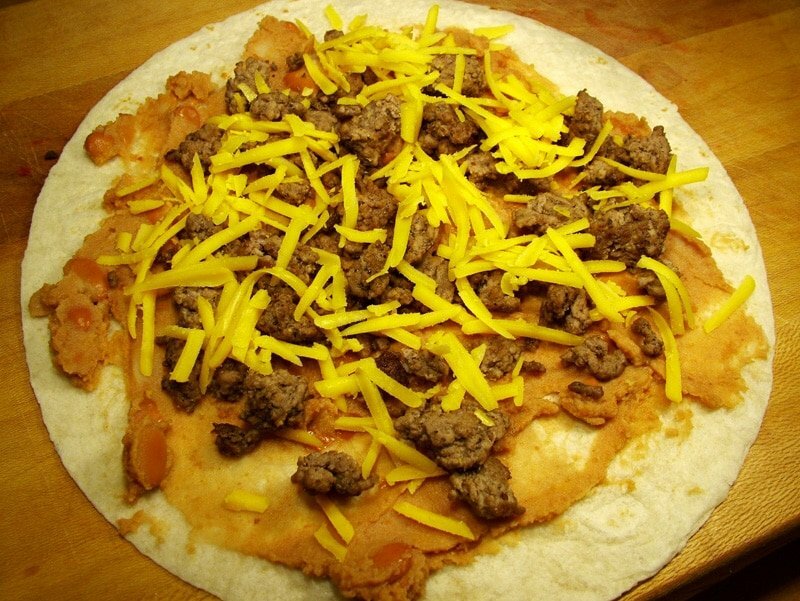 Hi There, absolutely, ground chicken would taste great in this burrito enchilada. I think it would taste just as good and the cooking method wouldn’t vary. So glad you asked because I’m going to try ground chicken in this next time I make it!